Monday - Friday 7:00 a.m. - 9:00 a.m.
Saturday & Sunday 7:00 a.m. - 10:00 a.m.
Dinner is by reservation only and is a set menu for the season with the exceptions of Holidays. "Sunday Turkey Dinner and birthday celebration"
"We made reservations for Sunday Aug 21. There were 7 of us and we were celebrating our friends 88th birthday. When I had called to make plans for dinner I asked them if they did cakes and they said yes. Our dinner was wonderful, the turkey was the best I have eaten along with everything to go with it. Just like the holidays, our wait staff was wonderful also. What a great surprise when they brought out the birthday cake along with candles, our friend was so surprised and delighted. When it came time to pay the bill we were told the cake was on them. They went above board to make us feel welcome and make it a special day for our friend. I can not say enough good things about this wonderful place and all who work there. Will be back soon. The Prime Rib is also to die for." All meals are served in the central dining room. 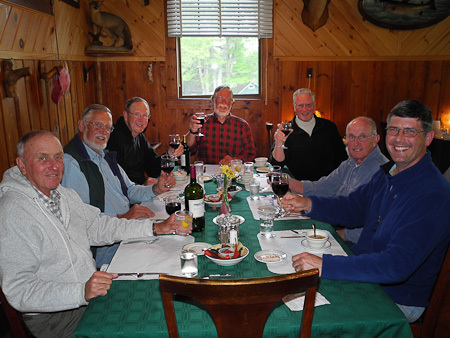 Our dining room has large plate glass windows which offers a magnificent view of Moose River and Blue Ridge. Maynard's In Maine is known for the reputation of serving good wholesome, home cooked, large meals. All dinners and desserts are made from scratch in our own kitchen.